It is with great pleasure that we welcome all of you to the Ecumenical Patriarchate, during your visit to our city – once known as Constantinople and today Istanbul. You have come from the Northern Europe to the very end of the continent in the sense that this is the city that sits on two continents, Europe and Asia. It is the bridge between the two, and likewise we continue to serve the same spirit of bridge builders among Churches, Religious Communities and Cultures. 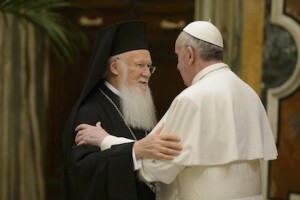 The Ecumenical Patriarchate has been, as you know, the Mother Church of the Orthodox Autocephalous Churches, including the Church of Russia and the other local Churches in Southeastern Europe, and continues until today as the centre of coordination and initiatives, being the first in the Orthodox world. The Orthodox Church is one in essence, and is not a federation of Churches. The Ecumenical Patriarchate is the Church that “presides over with love,” as “προκαθημένη τῆς ἀγάπης,” to use the expression of St. Ignatius of Antioch. We all know that it is out of this love and care that the Ecumenical Patriarchate still continues in the present to serve this bond of unity and ecumenicity throughout the world. Just a few days ago, we gathered here all of the bishops that serve under the Mother Church of Constantinople in various countries of the globe. We listened, we contemplated, we were informed, we discussed in a fraternal spirit and we celebrated together the Day of Prayer for the Protection of Creation, on September 1, the start of the new ecclesiastical year. Our purpose was, as our predecessor of eternal memory Ecumenical Patriarch Athenagoras used to say: “ἐλάτε νά κοιταχτοῦμε”, that is, to come and look each other in the eyes; for when you come closer to the “other” you discover that you are so close indeed. As you may know, we are moving into the final preparations for our Great and Holy Council, which is scheduled to meet here in Istanbul next June 2016. We have been working together with the other Sister Autocephalous Churches for decades now, and with the grace of God we are hopeful to convene this important and historic event in just a few months from this very day. We are fully aware of the needs of humanity today, and we care for the rights of men, women and children, suffering together at the same time with the oppressed, trying to raise concern for the need to care for tomorrow’s world. 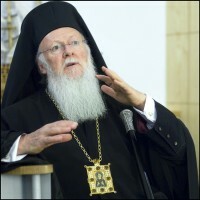 It is well known that the Ecumenical Patriarchate is highly involved in ecumenical endeavors, as a founder of the World Council of Churches and the Conference of European Churches, as well as for the sincere spirit of dialogue it carries out with all Christian Churches, including the Lutheran Church. We are also very much in favor of interreligious dialogue as well, especially over the past 30 years with Judaism and Islam. We are all aware of and follow the necessity for such dialogue today. As far as the participation of the Ecumenical Patriarchate in efforts to protect the environment, we have a rather long history but still a long way to go! Our mission is to make it well known throughout the world that we are all the caretakers and not the owners of our common “OIKOS”. We care for our common globe and we want to preserve it for the future generations to come. Churches indeed have, through sermons, catechism and continuous education, a serious responsibility to inform our faithful about these matters. We would like to take this opportunity to thank the Swedish authorities for your support of the Ecumenical Patriarchate and the European side of Turkey. 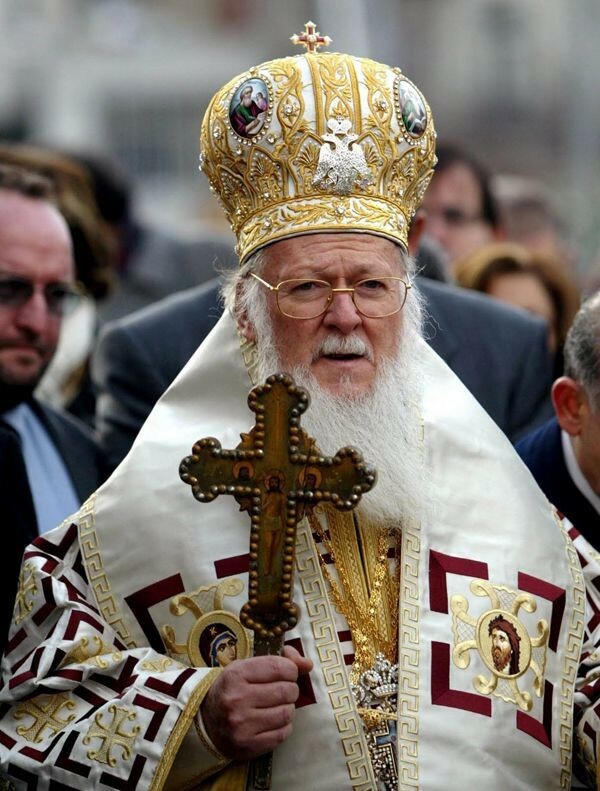 The Ecumenical Patriarchate, in addition to its continued pursuits with the Conference of European Churches, was the first among the Orthodox Churches to establish an official “liaison office” to the European Union in 1994. Thus, we continue to be informed on all matters that the European Union as well as the Council of Europe are discussing and are deciding upon, especially those decisions which concern Churches and Religious Communities. Article 17 of the European Treaty offers us the possibility of this continuous, transparent and sincere dialogue with European Institutions. We, as the Ecumenical Patriarchate, have initiated dialogues with political groups of the Members of the European Parliament. Ultimately, we believe in dialogue and we make it the vehicle par excellence for achieving our goals. We are following the developments in our own country, the Republic of Turkey, and we encourage all efforts undertaken by our President since the time he served as Prime Minister. We recognize progress in some areas and we are grateful for the positive steps taken concerning both the rule of law and the so called “acquis communautaire”. Turkey has been a candidate country since 1999, and since 2005, the European Union has opened accession negotiations with her. There are 35 chapters of accession negotiations and these are in different areas. We know that there are difficulties and we acknowledge the positive steps taken by Turkey, while encouraging the country to continue in the same spirit regarding issues of our Church and the other religious minorities. There are still unsolved issues such as the legal status of the Ecumenical Patriarchate, the opening of the Theological School of Halki, and the return of properties to the Church, to mention just a few. We are following these matters with great concern and we are hopeful for a better future and open dialogue with the authorities. We are very grateful to you since you, too, are involved in this area and working for this purpose in Sweden. Solidarity is the only measure we have, and has proven to be the most effective one! We would like to take this opportunity to express our gratitude to the political and religious authorities in Sweden for their openness and their continuous support of our Church, as our communities for many decades have been present in this hospitable country of Northern Europe. For many years, we have been following the policy of Sweden concerning the welcoming and integration of migrants. Today, the measures taken by Sweden over the years can certainly serve as a model for addressing the hundreds of thousands of migrants who, fleeing the crisis in the Middle East, look to Western European countries for a better future. We need to be attentive to their appeals and offer care by any means necessary, especially keeping in mind the ever so relevant words of the Gospel of Matthew (25:35): “for I was hungry and you gave me food … I was a stranger and you welcomed me”. We are grateful to you for the good and effective cooperation with our Exarch, His Eminence Metropolitan Cleopas of Sweden and all Scandinavia. In his person, we have placed much confidence and trust, and the Mother Church of Constantinople, – which has elected him to be the Metropolitan of this mission – is, indeed, very satisfied with the outcome so far. Metropolitan Cleopas has indeed – through his pastoral approach, ecumenical spirit, and academic background – been able to create in a short period of time excellent relations in order to fulfill the mission of the Church there in the best possible manner. The Ecumenical Patriarchate is very proud and happy to count him as a member hierarch of our Church’s Holy and Sacred Synod. Once again, we thank you for this useful and needed visit, which we hope will establish closer cooperation. We need you to continue with these endeavors and we count on your goodwill and cooperation. May the grace of our Triune God be with you and your families, as well as with the great Nation that you represent.